Round three began at the end of August. Another month of Lupron injections, oral estrogen, and 7:30am morning monitoring with blood draws and sonograms, but somehow this time, I knew it was going to work out. Well, at least, I knew we would make it to the egg fertilization stage where eggs have been retrieved from our donor and D has made his contribution to the process. I didn’t know until the first failed cycle that one cycle is considered complete when fertilization has been attempted, i.e., that the donor has contributed eggs, and D has contributed sperm. Whether or not the fertilization is actually successful doesn’t matter. Once fertilization has been attempted, even if no viable blastocytes are produced, the cycle is over. In the two previous cycles, we had never gotten to the egg retrieval process because our doctor felt the donors weren’t going to be able to produce viable eggs. Towards the end of September, we got the first call from Nurse Giggles telling us that this time was the charm; our donor’s levels were exactly where they should be and the situation was a “go.” D had to report at 7:30am on a Sunday morning. He had to bring ID and follow some pretty funny, but I’m sure quite necessary rules, like he was not to joke about why he was there or make any silly comments. I’m sure working in the sperm retrieval department of a fertility clinic, you must just hear it all and it must get pretty old pretty quickly. Twenty-four hours before reporting at the clinic, sperm donors are supposed to ejaculate. When we first heard this, we speculated about the call coming while D was at work or in some other inconvenient place. It will come as a great relief, I’m sure, to any of D’s colleagues reading this that this did not happen. The call came over the weekend. At the same time that D was making his contribution, the egg donor would report to another floor of the clinic for her surgery to retrieve the eggs. To protect her privacy, I was not allowed to accompany D to his appointment. I was also not supposed to be near the clinic at all. Especially because this was all happening on a Sunday when very few people would be around the clinic, it would be relatively easy to spot our donor if I stood, let’s say, in the lobby of the building. In the months that I had been going in for morning monitoring on weekdays, I started to spot the donors coming in for retrieval. They usually had a suitcase or overnight bag with them and weren’t alone. They were undergoing anesthesia and would need to stay for several hours and be accompanied home. I, of course, stayed home that Sunday while D went in. Then the waiting…would the eggs actually fertilize and would some or any be deemed viable for transfer? If not, if we wanted to try again, we would be on the hook for another full cycle at 31K. Fortunately for us, 3 days later, we heard miraculous and wonderful news! Forty eggs had been retrieved and 7 looked good! We would have to wait another couple days, but the news was as good as we could hope for at this point. Finally, 2 days later, we found out that 4 of the blasts looked viable and that our embryo transfer procedure could be scheduled for October 1, 2010! Next time: Pregnant until proven otherwise! Thanks for following and reading! 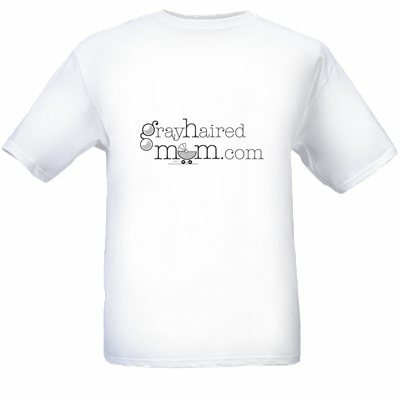 If you’d like a t-shirt (size XL or XXL only) or a pen, email me at grayhairedmom@gmail.com. You pay $6 shipping thru paypal. Please comment below! I don’t know if I could stay home….. I would probably be in a coffee shop or in a tree across the street with some high powered binoculars. lol! so funny! I had a friend who offered to hang out at the fornt door and take pictures of any 20-ish woman walking in with a suitcase. But, it truly is the donor’s choice to remain anonymous. There are programs where records are kept so that someday maybe the baby could choose to meet the donor, but she chose this one. I had to respect that. But I do still struggle and one day, I’m sure there will be questions…..